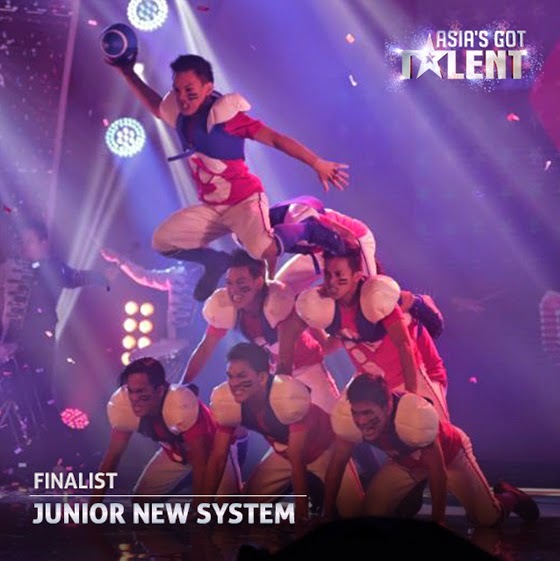 VIDEO: Junior New System's performance in finals of Asia's Got Talent - Balita Boss! Dance troupe Junior New System pushes the boundaries once again, with an American football themed Super Dance that makes the crowd flip! Filipino dance group Junior New System once again wowed the judges for an intensifying American football theme performance in the grand finals of Asia's Got Talent on Thursday, May 7, 2015 held at Marina Bay Sands in Singapore. Aside from Junior New System, there are eight other acts performed in the grand finals of “Asia’s Got Talent,” including fellow Filipinos Gerphil Flores - classical singer, El Gamma Penumbra - shadow play group, and Gwyneth Dorado - ten-year old singer.